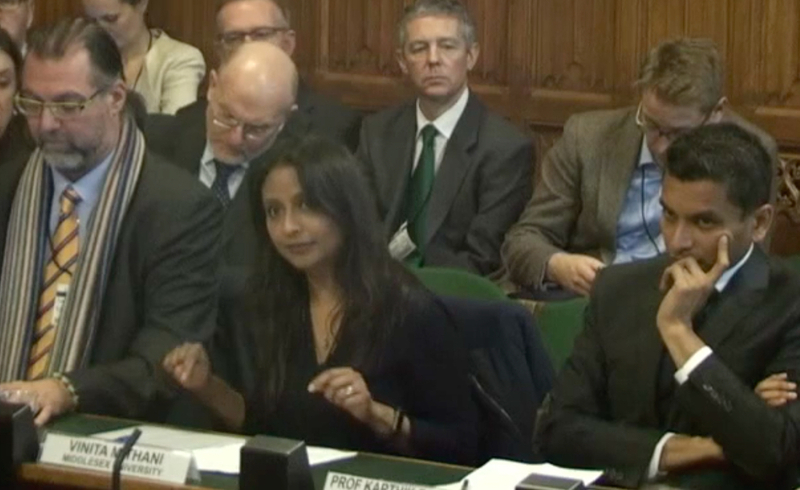 On Tuesday 15th January, MDX Accounting lecturer Vinita Mithani gave evidence to the Business, Energy and Industrial Strategy Commons Select Committee, as part of its enquiry into the future of audit. The enquiry is looking into the likely impacts of the Competition and Market Authority's ongoing study and Sir John Kingman's review into the Financial Reporting Council on quality levels and competition in the statutory audit market. Vinita's research is in this field, and the Committee's invitation came after she wrote two articles for the Institute of Chartered Accountants in England and Wales' professional magazine Economia in 2018, on the conflict of interest for auditors under the present set-up, and on the risk that attempting to increase market competition could have perverse effects on audit quality. In the session, she warned that shifting to joint audit arrangements with the aim of boosting quality, independence and choice could lead instead to “two audit firms competing to be management’s favourite”. Vinita presented evidence alongside academics from Oxford, Manchester and Aston Universities. Her full written evidence will be published on the Parliament website in due course. She is a chartered accountant by background with more than 20 years under her belt in practice and industry, so her views are informed by both academic research evidence and her experience as an auditor and a client of auditors. At Middlesex, where she initially lectured part-time, then full-time since the 2016-17 academic year, she has been nominated on a number of occasions for student-led teaching awards. Vinita says the prospect of the evidence session was "extremely daunting. The days leading up to it I was really nervous. But then I thought they wanted me to bring what I can bring. And I've spent the last four months looking at the literature on exactly this". "Once there, you switch on to what you need to do, I didn't let it affect me". And the encouraging thought struck her, she says, that "if it has an impact, I've done my bit for society".